Using premium plant-based sources such as pumpkin seed and super-foods like chia seed and sprouted quinoa, Bodylogix® Vegan Protein packs a 25 g protein punch and delivers a complete amino acid profile. 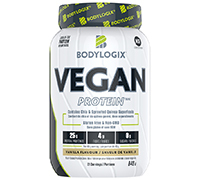 Combined with 16% of your recommended daily intake of fibre, Bodylogix® Vegan Protein makes it easy for anyone living a vegan lifestyle to get the fibre and protein they need. The best part — a naturally smooth, creamy protein full of flavour that is non-GMO, gluten free, made in a peanut free facility and contains only natural colours, flavours and sweeteners. Third-party certified by NSF, you can trust Bodylogix® to deliver the highest quality and safety standards. When it comes to fuelling your body, you get what you put in. Add 1 scoop (40 g) to a blender, shaker cup, or glass filled with 250 ml (8 oz.) of cold water or your favourite beverage (vary the amount of liquid to achieve your desired taste and sweetness level). Blend, shake or stir for 20-30 seconds or until powder is dissolved.